We’ve gotten plenty of recognition and praise for offering the finest in variety, quality, service and pricing as an Ohio Amish furniture store. Nothing could make us prouder, except maybe the strong connection we have also established with the more than 70 Amish families we work with who handcraft the pieces, and maybe also the strong community ties we have secured by being active in the area as a reputable business since 1992. All of the finishing processes used meet EPA requirements. There is no waste. The Amish families and craftsmen who hand build each piece to custom order truly live the ultimate green lifestyle. Scraps are used for burning as fuel, the sawdust is used for bedding for the livestock or the gardening compost and there are generally not even extra pieces of furniture waiting around as back stock. You’ll also be glad to know that the solid hardwoods used are unlike other materials that can emit formaldehyde. Even the transport makes us “green.” The pieces are transported less than 100 miles to make it to our shops. Even en route blankets are used to protect the pieces instead of wasteful, disposable packaging materials. Not only that, but just think how your Amish furniture will withstand the test of time and become family treasures passed down for generations to come. Cheap, disposable furniture is already filling up plenty of landfill space. Don’t buy tomorrow’s trash to furnish your home. Invest in future heirlooms. Not sure what you will find among the best name in Ohio Amish Furniture? Here is an idea of what rooms we can help you take care of when you shop at Amish Originals Furniture Company in Westerville Ohio. You’ll even find a great selection of home décor items. Browse our clearance section for even better deals on the same level of beautiful and quality pieces. The bottom line is that we have more to offer for furnishing your home than you probably realize. To get the latest information about your favorite Ohio Amish furniture store, take a minute to sign up for our newsletter. Join our mailing list to get the latest information about new incoming products or special promotions and sales. Or take some time to do some online browsing. You can take advantage of our “Wish List” section to add items to your virtual cart. 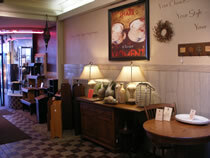 Start shopping online or in our showroom and find out why we are the trusted name for furniture stores Columbus Ohio.